Baseball, at times, is a simple game. You catch the ball, you throw the ball, you hit the ball. You win or you lose. Sometimes you tie, but only when Bud Selig is in attendance. And it’s just as simple a game to watch as a fan. But what happens things are not-so-simple? What happens when they get muddy? What happens when the team you root for acquires a player who’s been accused of domestic violence? What happens when that same player comes out and says things that make it seem as though he’s not very contrite about the whole thing? And what happens when your fellow fans sweep said player’s domestic violence accusation under the rug, or even worse, make heinous jokes about it? This was the conundrum facing many people at Yankee Stadium when Aroldis Chapman made his Yankees’ debut against the Kansas City Royals. And it was inevitable that Chapman’s debut was going to happen on Monday. Yankees manager Joe Girardi said it would, and the Yankees had a late lead so the time had come. But what would actually happen when he came into the game? 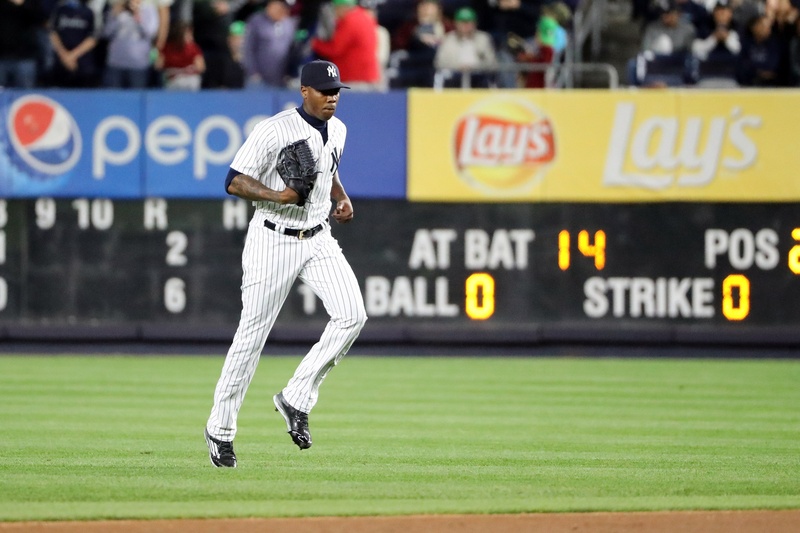 How would the fans react to seeing Chapman in Yankee pinstripes for the first time? Honestly, I wasn’t even sure how I would react. I am a woman who writes about baseball, and who roots for the New York Yankees, and I didn’t say much about Chapman coming over to the Yankees because at the time, I didn’t know how I felt. It was both a confusing situation and a disheartening one at the same time. After Dillon Gee got Didi Gregorius to pop out to end the eighth, there was a lull in the crowd. It was as if people were holding their breath in anticipation. Then, it started. First, with a very loud siren and then a boom. Suddenly the ribbon board that borders the entire bottom of the upper deck of the stadium turned into a steady shot of flames and the music started. It was Aroldis Chapman’s first entrance from the Yankee Stadium bullpen. A lot of people in the stadium cheered, seemingly not caring about any of his past transgressions. In fact, some of them, made light of the very thing that made it so Chapman would be making his 2016 debut on May 9, and not on Opening Day. Frankly, it was uncomfortable watching as people went crazy as Chapman made his way from the bullpen to the mound. It was probably uncomfortable for a lot of people to watch. You would usually follow the “root for the laundry, not the player” route in a instance like this, but this is an unusual situation. It wasn’t your run-of-the-mill cheer, it was a jubilant celebration for a someone who just finished serving a 30-game suspension for a serious criminal allegation and happens to hit 100 mph with regularity. As Yankees fans we’ve rooted for drug abusers and steroid cheats, and by the time David Justice joined the Yankees, everyone forgot about his alleged domestic violence past with ex-wife Halle Berry. Though Yankees fans remembered while he was a member of the Indians, chanting, “Beat your wife Justice, beat your wife!” every time he came to bat during Game 2 of the 1997 American League Division Series. Aroldis Chapman’s sins are fresh, only occurring last fall. So this is the first time as fans that we’ve had to deal with this kind of circumstance. And many people—fans and writers alike—were outspoken over the winter about it. Some people were saying they’d find it hard to root for the Yankees because they acquired Chapman, others were saying that they’d still root for the Yankees, but not root for Chapman. A lot of people understood what the Yankees did from a business standpoint, but not from a moral standpoint. And, as usual, fans of other teams just chalked it up to the Yankees being the Evil Empire. Of course, they’d acquire someone like Chapman. I watched Mariano Rivera jog to the mound numerous times over the years, and I have seen both Andrew Miller and Dellin Betances emerge from the Yankees bullpen. I never saw any of them get the kind of reaction that Chapman got. Not even Mo. While some people started chanting, “Cuban Missile,” one fan shouted “we support wife beating in New York,” which no, we do not. One person seated behind me in the left field bleachers turned Chapman’s bullpen entrance into a sexual experience for himself, saying truly appalling things about his body’s physical reaction to Chapman, and that’s when I knew things were completely out of control. And it almost felt like an out-of-body experience watching as this person was being celebrated as if he were a legendary rock star making his triumphant return to the stage. I so desperately wanted to be somewhere else, in a place where other like-minded people were also watching in disbelief, and abject horror, while the celebration lingered a little too long. I, along with a number of fans around me, did not stand when Chapman jogged in from the bullpen, and I’m sure there were a lot of others who kept their butts planted in their seats throughout the stadium. None of this takes away Chapman’s ability, of course. He threw the ball hard, like he always does, and fans were ‘oohing’ and ‘ahhing’ after every single pitch. Some were even guffawing after every triple digit radar gun reading. But sins often get swept under the rug, to keep from talking about them. Because if you don’t talk about them, there’s some feeling that maybe everything will go away. That’s not what happened at Yankee Stadium when Chapman warmed up to pitch the top of the ninth inning and when he entered the game. People were falling all over themselves to cheer for Chapman as if nothing ever happened, and it was distressing. It also turned what was a positive return to the stadium into a not-so-positive return for me. I was put off by my fellow fans’ blasé reaction to Chapman’s offense. And while Chapman served his time, so to speak, people need to be mindful of how they treat certain situations. Domestic violence is not to be joked about or celebrated, and it felt like that’s exactly what happened in Yankee Stadium. While Chapman’s conduct certainly deserved criticism and punishment, from everything I’ve read about it, it doesn’t appear that there’s enough evidence to say that he’s guilty of domestic abuse. Firing a gun in his garage was obviously reckless and dangerous, but it doesn’t look either law enforcement or MLB concluded that he physically abused his girlfriend. Chapman could be a monster, and is perhaps worst actor in sports. There’s really not enough evidence to say he’s a domestic abuser, however. Bare minimum, getting in an argument with your wife and then firing a gun a bunch of times is recognizable as pretty drastic intimidation to any reasonable person, right? I think you’re right. It’s a slippery slope. Reyes’ wife had bruises yet still decided against becoming a complaining witness against hiim. Chapman’s wife had no bruises and no charges were filed. Domestic violence is a heinous crime and should be punished severely, but if the victim ends up supporting the alleged victimizer it is very hard for third parties to make an accurate assessment of the facts. This article is unfair to the parties involved. Unfortunate you feel this way. How many women celebrated/clapped in the audience when Martha Stewart made her first tv show upon her release from prison? Her decision to trade on insider information cost some poor sap money (who was not privy to what she knew). That makes her a THIEF! Yet to the women in her tv audience, she was a hero! So please, save me your SELF RIGHTEOUS indignation when it comes to the applause that Chapman receive upon his return to Yankee Stadium. Yankee fans were welcoming Chapman because of his skill set on the mound NOT because he beat women! The bottom line is that as long as a person has value to the masses, their ‘crime’ will be overlooked by the masses.